Mt. Kailash (22028 Feet), considered to be a physical embodiment of the mythical Mt. 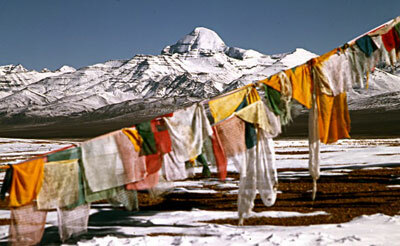 Meru, is believed to be the most sacred mountain in the world. Its snow dusted rock pyramid is located in the scenically rich area of western Tibet, which lies between the Himalayas and Karakurum ranges. It is considered most auspicious to make a religious pilgrimage circuit of its fifty-three kilometers or 32 miles.